Orwell’s List of "Crypto-Communists and Fellow Travelers"
For decades George Orwell’s blue quarto notebook filled with the names of 135 “crypto-communists and fellow travelers” languished mostly unexamined in the George Orwell Archives in London, attracting only passing interest from the few scholars granted permission by Orwell’s estate to examine the material. In his 1980 biography of Orwell, Bernard Crick, for example, made only a brief allusion to the list, writing that Orwell worried about “communist infiltration . . . and kept a notebook of suspects.” Many of those listed, Crick said, “are plausible as possible underground or front members, but a few seem far-fetched and unlikely.” A decade later Orwell’s authorized biographer Michael Shelden speculated that Orwell was “engaged in a continuous exercise of determining who was sincere and who was not.” The notebook was “primarily to satisfy [Orwell’s] own curiosity,” Shelden wrote. 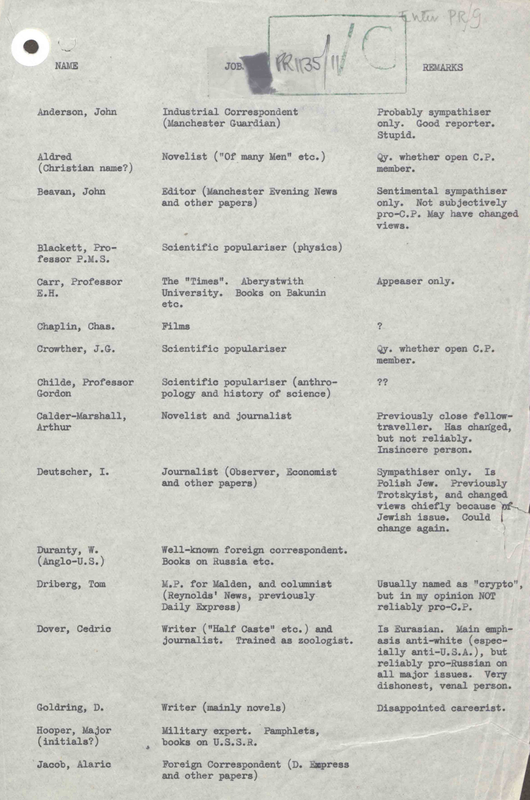 From the 135 names in the notebook, Orwell drew up a more limited list of thirty-five, which he sent to the Information Research Department (IRD) on May 2, 1949. “It isn’t very sensational and I don’t suppose it will tell your friends anything they don’t know,” he wrote the IRD. “At the same time it isn’t a bad idea to have the people who are probably unreliable listed.” This list—whose contents, it should be stressed, we can only infer from Orwell’s annotations in his notebook (the list in the IRD’s possession remains classified as a state secret by the British government) —included the historian E. H. Carr, the economist G. D. H. Cole, the Dean of Canterbury Hewlett-Johnson, the New Statesman’s Martin Kingsley, P. M. S. Blackett, W. P. and Zelda Coates, the journalist Walter Duranty, the pundit and M.P. Tom Driberg, the writer Cedric Dover, the Picture Post’s Tom Hopkinson, the M.P. Lester Hutchinson, the News-Chronicle’s Stefan Litauer, the Observer’s Iris Morley, John Macmurray (author of The Clue to History), the poet Nicholas Moore, the novelist Liam O’Flaherty, the News-Chronicle’s Ralph Parker, the M.P. D. N. Pritt, the Pan-African Federation’s George Padmore, Beaverbook Press’ Peter Smollet, the Navy commander Edgar P. Young, the writer Konni Zilliacus, as well as seven other individuals whose identities still remain a state secret. Of these seven figures whose identities are unknown, Orwell is even reported to have listed the name of his tax inspector.